Hello guys! Hope you're all well? I've got a blogger challenge for you today courtesy of the lovely peeps at Curvissa. 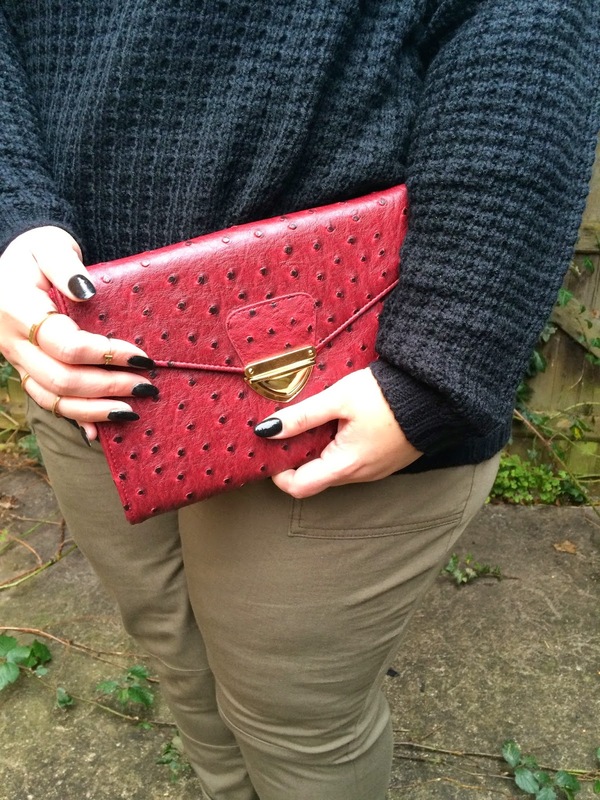 Myself and 4 other blogging babes have been sent this gorgeous dark red ostrich textured clutch to style up. I always like these challenges because it gives you an idea on how versatile a piece can be. The bag itself is big enough to out all your night out essentials without being too big, it does have a chain should you want to use it as a shoulder bag, but I like to just tuck it under my arm and go! I kept it casual but with dressy edge by adding heels, the deep red works nice with the muted tones of the khaki, I'd probably wear this out for a casual meal with friends. Curvissa has a huge range of bags on the website, it's definitely worth a look if you're on the hunt for a bag. Don't forget to check out all the girls posts to see how they styled it!